Bavarian Pretzel Bakery sells traditional soft salty pretzels in regular size and large. Buy them in 3 paks or 6 paks to get more for your money! We also sell soft pretzel stix with cheese packaged in a carry out box. Gourmet pretzels and stuffed pretzels are also available. We carry Coca- Cola fountain beverages and bottled water. Choose between 6 flavors of ICEE frozen carbonated beverages. Ask for a frequent buyer card! 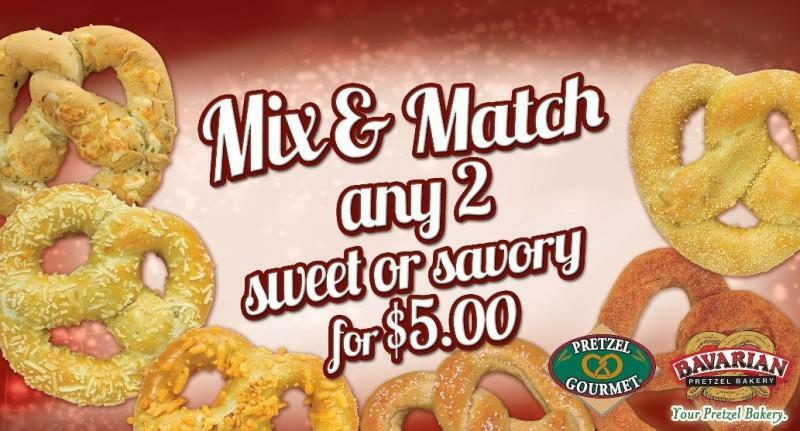 Use the card every time you purchase a pretzel and beverage combination you get a stamp when you get 5 stamps, your 6th snack combo is FREE!